Your opinion is requested in following case. 37 y/o male, 8 weeks ago sustained in MVA. Had 4 ribs fracture, subcapsular haematoma of spleen (was treated conservatively). Fully conscious on presentation, no pelvic complaints, no pelvic x-ray was taken. Was discharged after couple of days. Two weeks walked free of pain, with no aids, then started to complain pain in his left hip. Pelvic x-ray was taken in local hospital and displaced acetabular fracture was diagnosed, but patient was not refferred back to us as they decided to treat conservatively. We have experience of about 80 cases of acetabular fracture operative treatment. No experience treating delayed cases. Patient was scheduled for surgery today but this case raised a big disscussion on our morning conference and we could not find any orthopod who would let us to operate on him if he had this fracture :-) So we canceled procedure &..
At 8 weeks it will be virtually impossible to reduce this, and it could be argued that a lot of damage to the articular cartilage has already been done. Attempted reconstructive surgery would be a big prodedure with a wide exposure and carry considerable risk. It would also add to the likelyhood of a poor outcome from Total Hip Arthroplasty. Adopt a conservative treatment regime and advise him to take supplements which may be chondroprotective( omega-3 oil, glucosamine sulphate) and see what happens. There are plenty of bone -conserving hip arthroplasties to use in a patient in his late 30's( Mayo Hip from Zimmer, the resurfacing arthroplasties from Corin, UK or Midland Medical Technologies, UK) if you have to do a hip replacement. Depends on time after injury, risks of surgery, likelyhood of successfully treating the fracture, age of patient etc. 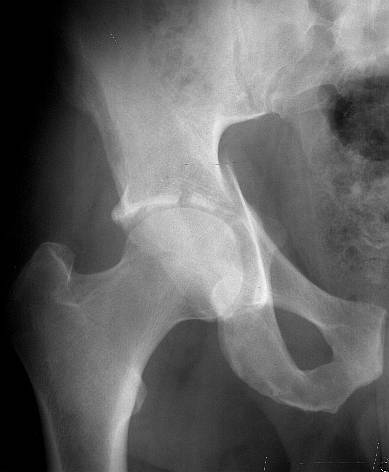 Secondary hip arthroplasty will give a better result with less risk than unsuccessful delayed primary fxation. I hope your residency is going well. Before any decision can be made regarding what to do, can you provide us with more films and information? Physical exam findings? What was his activity level before injury, what sort of work does he do? The iliac oblique reveals a displaced fracture of the posterior column, and it appears that the femoral head is not congruous with the acetabulum. AP, obturator oblique films and a CT scan will better reveal the extent of the injury. The first lesson to learn from this is that a pelvis Xray should be part of the trauma evaluation. A plain AP Xray coupled with a good physical exam would probably have picked this injury up. Missed injuries are one of the risks of the trauma business. At our hospital, we find injuries missed on the day of admission about 10% of the time. Usually they're in the hands and feet, but other locations are possible. Distracting injuries really do draw the patient's focus away from other sore spots. I bet this patient had a tough time differentiating what was left sided pain from his splenic injury and what was left hip pain. Most of the time, we pick up the missed injuries on the 2nd or 3rd hospital day. If you're sort of naturally suspicious it helps. I think there may have been an article on missed injuries in the Journal of Trauma - maybe a year ago or so. 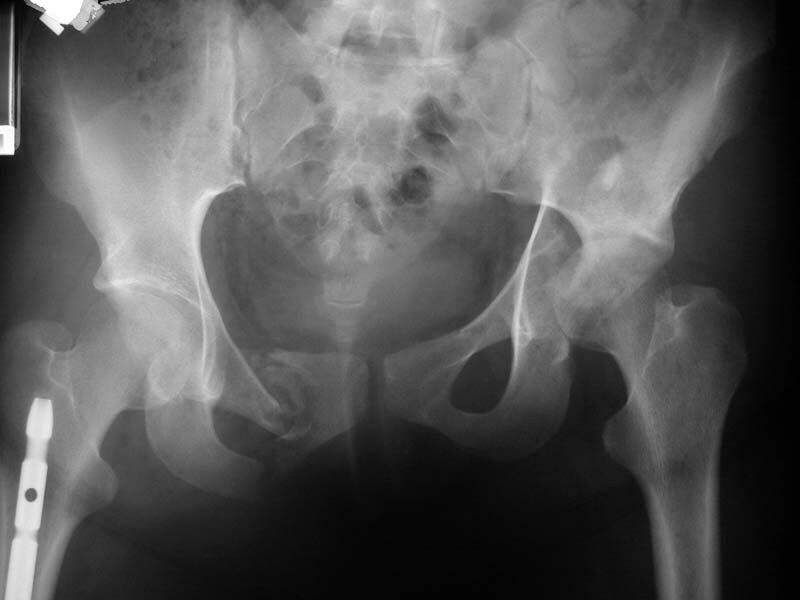 If the rest of the Xrays confirm that this young man has a displaced acetabular fracture, then I would vote for open reduction and internal fixation. Choice of surgical approach depends on fracture pattern. If the surgeons at your center have no experience or desire to treat this sort of acetabular fracture, send the patient somewhere where the surgeons have more experience with acetabular fractures. I'm 35. If this was my hip, I would want to have this fixed. 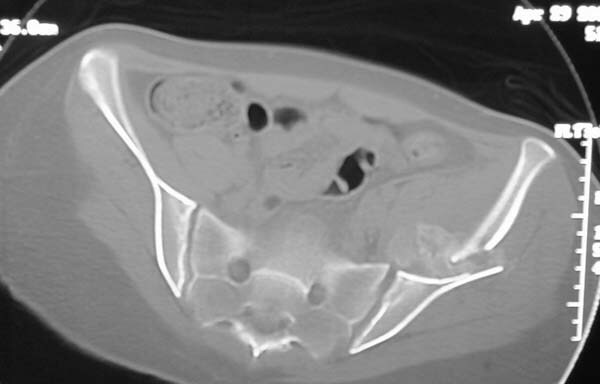 The CT scan confirms what the iliac oblique showed - the acetabulum is incongruous, and the femoral head is following the caudal piece medially. The other thing the femoral head is doing is grinding up against that displaced fracture. This is going to lead to erosion of the femoral head cartilage, and rapid onset of post-traumatic arthritis. How long will it take? I've seen it happen in less than a year. I have few questions on the plan to operate now. 1) At eight weeks after the injury what are we hoping to achieve by operating now? 2) Wouldn"t the fracture be already sticky if not malunited already unless you are able to demonstrate radiologically movement at fracture site? 3) The fracture does not involve the weight bearing area of the acetabulum from the available x-rays. Does the patient have any symptoms on walking or are you trying to treat the x-ray by offering surgery now ? No hard feelings on my queries, I hope. 1) At eight weeks after the injury what are we hoping to achieve by operating now? Hope to achieve anatomic reduction of the joint, to decrease the risk of post-traumatic arthritis and decrease the chance of need for further surgery. 2) Wouldn"t the fracture be already sticky if not malunited already unless you are able to demonstrate radiologically movement at fracture site? I'm sure it already is sticky. It will probably be necessary to remove callus from the fracture site to get it reduced. 3) The fracture does not involve the weight bearing area of the acetabulum from the available x-rays. Yes it does. The CT scan reveals a fracture through the weight bearing dome. Does the patient have any symptoms on walking or are you trying to treat the x-ray by offering surgery now ? Apparently, pain with walking was the symptom that drove him to seek treatment at the hospital where the first pelvic Xray was obtained. My mail was based on the first mail from Alo Kullerkann before the CT pictures were avilable on the net. Later I saw the CT pictures and realised that weight bearing areas were involved. > I hope your residency is going well. > Physical exam findings? What was his activity level before injury, what sort of work does he do? He is an employee, used to live pretty active life, not high-rank, just fittness. Pt. has no limitation in his hip ROM. Feels occasional pain in groin. At present walks on crutches, toe touch, no symptoms. IMHO, it' s a transverse fr. > The first lesson to learn from this is that a pelvis Xray should be part of the trauma evaluation. Totally agree, tough I have read a paper stating pelvic AP in conscious patient to be unnessessary. >I bet this patient had a tough time differentiating what was left sided pain from his splenic injury and what was left hip pain. He has fractured right acetabulum. Patient was fully conscious, adequate, pelvic examination left no suspicion of pelvic trauma. How to explain that he walked 2 weeks with no symptoms? > If the surgeons at your center have no experience or desire to treat this sort of acetabular fracture, send the patient somewhere where the surgeons have more experience with acetabular fractures. That' s the main part. Estonia has population of 1.3 mln. ANY surgeon will NEVER gain experience that experts of acetabular surgeons in developed countries may have. We are the refferral centre for pelvic and acetabular surgery. That is the reality. My chief' s experience of 80 fresh acetabular fractures is the best Estonia has. What is list opinion - should we try? There is always a first case. > I'm 35. If this was my hip, I would want to have this fixed. Yeah, me too, but done by you! Our consulting physician, who specializes in hip joint traumas, recommends the following: Operative treatment is very traumatic and not effective (due to the remoteness of the trauma). In case of the operation it is necessary to fulfill three-radial approach with trochanter osteotomy in order to expose the anterior and posterior columns. It is better to continue conservative treatment till the acetabulum fractures unite and nearthrosis form in the place of the central dislocation. The term of the THR will depend on the destruction of the head of the joint. According to our experience this may take from 3 months to 30 years. 19 year old girl 3 weeks out from injury. Femur, tibia, ankle and patella fractures all fixed at an outside hospital. Her pelvic fracture and acetabular fracture were treated in tractionuntil she was transferred to Parkland. How would you treat this one? I would fix- needs some type of extensile approach, and may be made easier by releasing the contralateral pubis to relieve deforming force. First, educate the referring colleague that "sooner is better" for all, especially the patient...you have an ICU too. Then, reduce and fix it based on a preop plan which is based on the fracture specifics, detailed in the imaging studies. Maybe everyone should (re)read Letournel's book regarding delayed fracture reduction and fixation.